Tags: 'The View', Blames, Pro-Lifers, Colorado Shooting, GOP 'Rhetoric' Responsible To share or post to your site, click on "Post Link". Please mention / link to the Greater Fitchburg For Life. Thanks! Tags: Former Miss USA, Dumps, Tim Tebow, Because He’s Committed to Abstinence, Until Marriage To share or post to your site, click on "Post Link". Please mention / link to the Greater Fitchburg For Life. Thanks! Tags: Hillary Clinton, Exploits, Colorado Springs, Shooting, Planned Parenthood To share or post to your site, click on "Post Link". Please mention / link to the Greater Fitchburg For Life. Thanks! Tags: Happy Thanksgiving, 2015, celebrating, supporting, sanctity of life To share or post to your site, click on "Post Link". Please mention / link to the Greater Fitchburg For Life. Thanks! 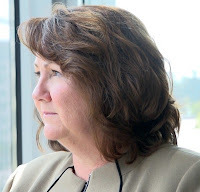 Judie Brown, American Life League: It is sometimes difficult to extricate one’s self from the daily struggle of defending babies long enough to see the glory and wonder of the many gifts God has given us. But at this time of year we naturally do—and should—focus on those blessings, especially when we consider what it means to be pro-life in America today. The single defining characteristic we all hold in common is our love of family and our love of God, who is the Author of Life and who created each and every one of us. Without Him there would be no family; without Him there would be no opportunity to love others for His sake. We thank You, Lord, for the gift of life—for our lives and the lives of those we love. We recognize that, in this battle to defend the most defenseless among our brothers and sisters in Christ, the babies we represent and defend do not know us. Yet we are given this awesome responsibility of being their voice when we witness to the expectant mother considering abortion, at the local clinic where these babies are killed, and amidst the lawmakers and others in the public arena who need to hear the truth. We thank You, Lord, for the gifts of fortitude and counsel which motivate us to discern what is right and to take the actions necessary to remind others of this even when it is extremely difficult or uncomfortable to do so. We understand the many challenges that confront our fellow human beings on a daily basis and the temptations that abound to stray from what is right and at times to do so without realizing the consequences of their actions. Thank You Lord for the gift of compassion that helps us reach out to others in times of great pain or suffering. We know that in You, Lord, all that we do bears fruit as long as we entrust our actions to You with a sincere and humble heart. We thank You, Lord, for this special time of togetherness with our loved ones and the opportunities we have to be with family members, to embrace those we love, cherishing moments of peace and joy that accompany the celebration of Thanksgiving. 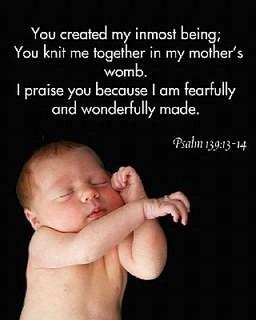 Thank You, Father, for having created us and given us to each other in the human family. Thank You for being with us in all our joys and sorrows, for Your comfort in our sadness, Your companionship in our loneliness. Thank You for yesterday, today, tomorrow and for the whole of our lives. Thank You for friends, for health and for grace. May we live this and every day conscious of all that has been given to us. Amen.We wish you, your families, and loved ones a very happy and joyous Thanksgiving. Tags: Thanksgiving, reflection, Judie Brown, American Life League To share or post to your site, click on "Post Link". Please mention / link to the Greater Fitchburg For Life. Thanks! Tags: Abortions, Decline, Historic Low, CDC Report, 31,000 Babies Saved To share or post to your site, click on "Post Link". Please mention / link to the Greater Fitchburg For Life. Thanks! Tags: Missouri, Down to One Abortion Clinic, Planned Parenthood, Stops Abortions in Columbia To share or post to your site, click on "Post Link". Please mention / link to the Greater Fitchburg For Life. Thanks! Tags: Shonda Rimes, Producer, ABC’s Scandal, Showing Abortion, During “Silent Night,” Sits on Planned Parenthood Board To share or post to your site, click on "Post Link". Please mention / link to the Greater Fitchburg For Life. Thanks! Tags: Hillary Clinton, U.S. Should Fund Abortions, Around the World, Method of Family Planning To share or post to your site, click on "Post Link". Please mention / link to the Greater Fitchburg For Life. Thanks! Father FrankPavone, Janet Morana and Alveda King share messages about the upcoming U.S. Supreme Court hearing of Priests for Life v. Obamacare's HHS Mandate. Tags: Supreme Court, SCOTUS, Priests for Life v. HHS Mandate, FrankPavone, Janet Morana, Alveda King To share or post to your site, click on "Post Link". Please mention / link to the Greater Fitchburg For Life. Thanks! Tags: Scandal, Actors, Producer, Defend Playing “Silent Night”, Character Aborts Her Baby To share or post to your site, click on "Post Link". Please mention / link to the Greater Fitchburg For Life. Thanks! Tags: Planned Parenthood, Sues, Texas, De-Funded, After It Sold, Aborted, Baby Parts To share or post to your site, click on "Post Link". Please mention / link to the Greater Fitchburg For Life. Thanks! 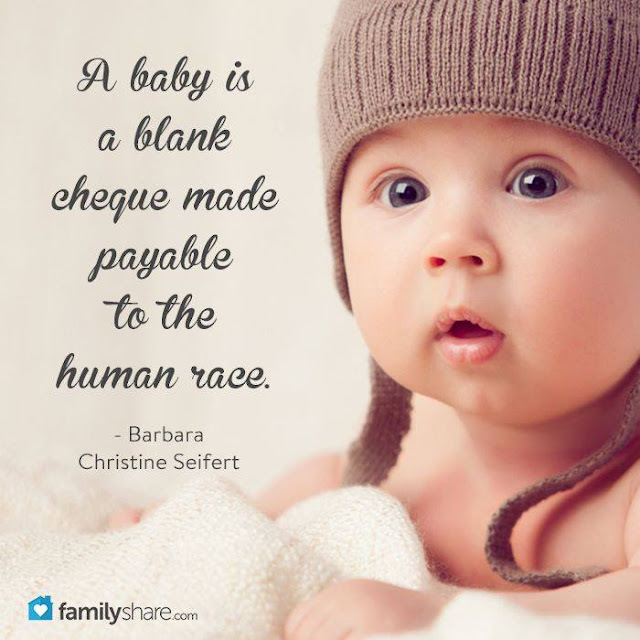 A Baby Is A Blank Cheque . . . Tags: baby, human race, To share or post to your site, click on "Post Link". Please mention / link to the Greater Fitchburg For Life. Thanks! Tags: Amnesty International, Pushes, Legalizing Abortion, Ireland To share or post to your site, click on "Post Link". Please mention / link to the Greater Fitchburg For Life. Thanks! Tags: UN, Committee on the Rights of the Child, Tells, Pro-Life, Poland, Legalize Abortions To share or post to your site, click on "Post Link". Please mention / link to the Greater Fitchburg For Life. Thanks! Remind Everyone: Abortion Costs Lives! 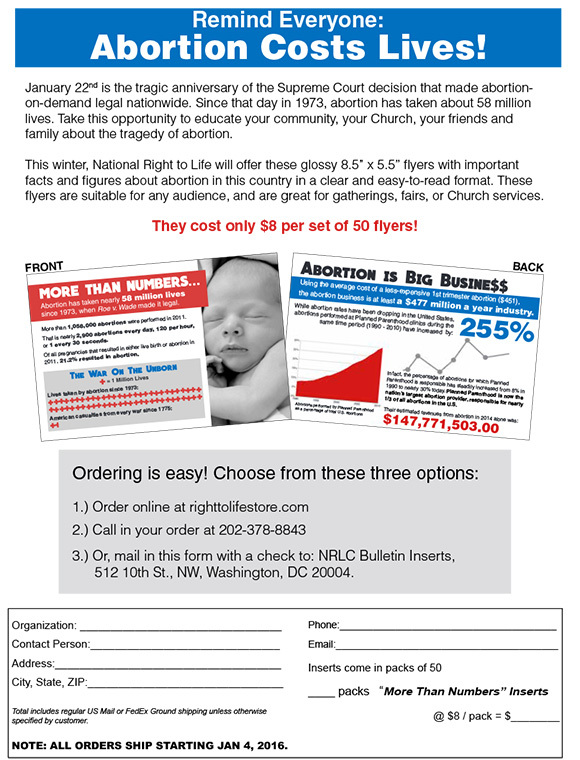 National Right to Life: Remind Everyone: Abortion Costs Lives! 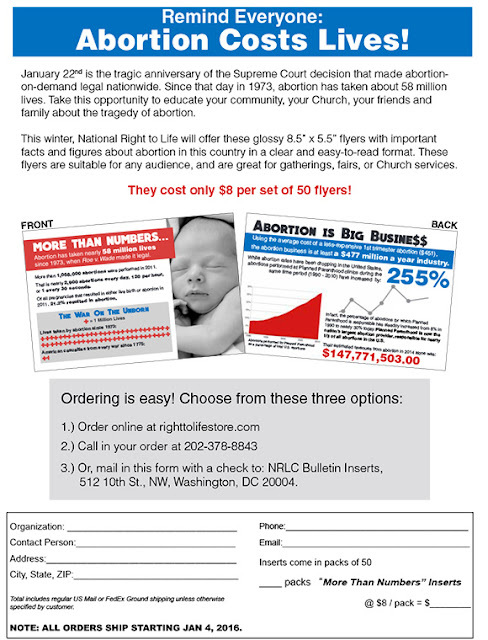 We offer 8.5' x5.5" flyers with important facts and figures about abortion in a clear and easy-to-read format. Great for gatherings, fairs and church services. Visit our site for more info. Tags: National Right To Life, Remind everyone, Abortion, costs, lives, flyers, To share or post to your site, click on "Post Link". Please mention / link to the Greater Fitchburg For Life. Thanks! Massachusetts Citizens for Life: We were so excited to see this information from the Lozier Institute listing all the health care plans in Massachusetts. You will see # 10 United Healthcare does not cover abortions! I had thought that all plans in the Bay State had to cover abortions. What an opportunity! The article below saying that United Healthcare may have to exit individual insurance exchanges. Do any of you know more about UnitedHealthcare? Boston Medical Center HealthNet Plan (5 plans): All plans cover elective abortion (2016 rep. communication). Celticare (3 Plans): All plans cover elective abortion (2016 plan documents). Fallon Community Health Plan, Inc. (13 Plans): All plans cover elective abortion (2016 plan documents). Harvard Pilgrim Health Plan (10 Plans) : All plans cover elective abortion (2016 rep. communication). Health New England (9 Plans): All plans cover elective abortion (2016 plan documents). Minuteman (9 Plans): All plans cover elective abortion (2016 plan documents). Neighborhood Health Plan (9 Plans):All plans cover elective abortion (2016 plan documents). Tufts Health (12 Plans): All plans cover elective abortion (2016 plan documents). UnitedHealthcare (11 Plans): Plans do not cover elective abortion (2016 plan documents). Tags: Massachusetts Citizens for Life, medical plans, MA, United Healthcare, Plans do not cover abortion, maybe leaving insurance exchanges To share or post to your site, click on "Post Link". Please mention / link to the Greater Fitchburg For Life. Thanks! Tags: #‎WomenBetrayed‬, Bus Tour To share or post to your site, click on "Post Link". Please mention / link to the Greater Fitchburg For Life. Thanks! 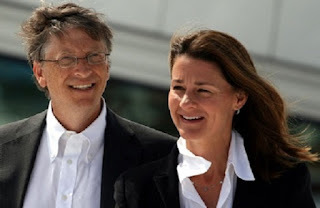 Tags: Gates Foundation, Pushes, Dangerous Contraceptives, on Africans To share or post to your site, click on "Post Link". Please mention / link to the Greater Fitchburg For Life. Thanks! Planned Parenthood Asked for One Word to Describe What it Does. . . . Tags: Planned Parenthood, Asked for One Word, Describe What it Does To share or post to your site, click on "Post Link". Please mention / link to the Greater Fitchburg For Life. Thanks! by CitizenLink Team: Oklahoma Gov. Mary Fallin has sent a letter to the Health Care Authority Board asking them to stop all Medicaid contracts with Planned Parenthood. Fallin cited results from integrity reviews conducted on the abortion seller that found a 14-20 percent error rate in its Medicaid billings at Oklahoma facilities. Kellie Fiedorek, an attorney with Alliance Defending Freedom, said Fallin is right. Defunding Planned Parenthood in Oklahoma will not interfere with a woman’s right to legitimate health care services. There are more than 120 other providers who offer a broad spectrum of services for women. Tags: Oklahoma, Governor, Mary Fallin, defund, Planned Parenthood To share or post to your site, click on "Post Link". Please mention / link to the Greater Fitchburg For Life. Thanks! Tags: Voting, Candidate Who Supports Abortion, Formal Cooperation, With Evil To share or post to your site, click on "Post Link". Please mention / link to the Greater Fitchburg For Life. Thanks! Tags: Attorney General, Loretta Lynch, Haven’t Reviewed, Planned Parenthood, Videos To share or post to your site, click on "Post Link". Please mention / link to the Greater Fitchburg For Life. Thanks! Tags: Planned Parenthood, to Spend $20 Million, Elect,, Pro-Abortion Hillary Clinton, Take Over Congress To share or post to your site, click on "Post Link". Please mention / link to the Greater Fitchburg For Life. Thanks! Tags: U.S. Senate, Republicans, De-Fund Planned Parenthood, “We’re Proceeding” To share or post to your site, click on "Post Link". Please mention / link to the Greater Fitchburg For Life. Thanks! Tags: NRLC, Senate pass, pro-life, reconciliation bill To share or post to your site, click on "Post Link". Please mention / link to the Greater Fitchburg For Life. Thanks! ARE YOU PROUD OF OUR PRESIDENT? Tags: President Obama, Secret, $1 Million Grant, Planned Parenthood To share or post to your site, click on "Post Link". Please mention / link to the Greater Fitchburg For Life. Thanks! Tags: Planned Parenthood, $51,000 in Fines, Dumping Aborted Babies, Public Landfill To share or post to your site, click on "Post Link". Please mention / link to the Greater Fitchburg For Life. Thanks! Tags: Katie Couric, Complains, Pro-Lifers, Make It, “Harder Than Ever”, to Work, Planned Parenthood To share or post to your site, click on "Post Link". Please mention / link to the Greater Fitchburg For Life. Thanks! Tags: Gates Foundation, Another $120 Million, Promoting Abortion, Population Control To share or post to your site, click on "Post Link". Please mention / link to the Greater Fitchburg For Life. Thanks! by Kristen Tate, Briebart: On Thursday the Supreme Court unanimously struck down a law in Massachusetts which prohibited protesting near abortion clinics. The law--which banned protesting from 35 feet within the entrance of abortion clinics--violated First Amendment rights of pro life protesters who wished to demonstrate at the entrance of abortion clinics peacefully. In response to the Supreme Court's ruling, Presidential candidate Texas Senator Ted Cruz said in a statement, "The Supreme Court vindicated the First Amendment rights of citizens who peacefully counseled women about alternatives to abortion at a Massachusetts clinic. Once again, the Supreme Court unanimously rejected the litigating position of the Obama Administration, which opposed free speech rights in an amicus brief. The Court rightly invalidated a Massachusetts law that suppressed peaceful, non-obstructive speech from public sidewalks near abortion clinics." Although the court's ruling was unanimous, the justices had varied reasons behind their decisions, according to the New York Times. Chief Justice John G. Roberts Jr. wrote the majority opinion, arguing that the state could explore other options for preventing harassment at abortion clinics. Liberal justices Ruth Bader Ginsburg, Stephen G. Breyer, Sonia Sotomayor and Elena Kagan joined Roberts. The law was initially questioned when a grandmother from Boston, Eleanor McCullen, sued with other activists over the restrictions. 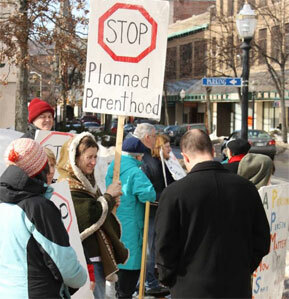 The group claimed they were significantly limited in their protest efforts at various Planned Parenthood locations. Pro life advocates point out that there are already various law in place–both state and federal–that protect health care professionals and patients at abortion clinics. Tags: Supreme Court, Unanimously Strikes Down, Protest-Free Zones, Massachusetts Abortion Clinics To share or post to your site, click on "Post Link". Please mention / link to the Greater Fitchburg For Life. Thanks! Tony Perkins' FRC Washington Update: The most important vote on the bill to defund Planned Parenthood isn't a senator's -- it's the parliamentarian's! Until now, most Americans had probably never heard of Elizabeth MacDonough, who, for all practical purposes, is the Senate's referee. The first-ever woman to hold the job, parliamentarian MacDonough will have the weight of the House's budget reconciliation bill on her shoulders when the chamber considers it as early as next week. As the umpire of elaborate procedures and points of order, MacDonough is often called on to settle bitter disputes over what's germane and what isn't. The same will be true this month, as Republicans try to get the first bill defunding Planned Parenthood and pieces of ObamaCare onto the president's desk. Under the budget reconciliation process, the parliamentarian will be a major figure in deciding whether the bill passes the "Byrd test." If it doesn't, conservatives are back to square one on the group's funding. Right now, the only thing standing in the way of advancing the measure is a 25-year-old rule that gives Democrats their only real crack at blocking the bill. 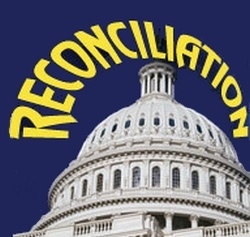 Since reconciliation speeds up the process, the former Senator Robert Byrd created an accountability mechanism. Under his rule, senators can object to a bill if they think it doesn't change spending or reduce the deficit (which is the ultimate purpose of reconciliation). The Senate could waive the rule, but it would take 60 votes that the GOP doesn't have. Obviously, the President's party will do anything to protect Planned Parenthood and ObamaCare -- including arguing that these provisions are irrelevant to the budget process. That's where Elizabeth MacDonough comes in. As the parliamentarian, it will be up to her to wade through all of the legalese and decide if they're right. Democrats have spent the last several weeks insisting that the Planned Parenthood provision isn't germane. Republicans have fired back that their interpretation is too narrow. "I literally don't understand their logic," Senator Mike Lee (R-Utah) said in an interview with The Daily Signal. "The Byrd rule allows for a whole lot more repeal of ObamaCare than what is being contemplated." Senator Ted Cruz (R-Texas) also chimed in. "At the end of the day," he pointed out, "the Senate parliamentarian is an employee of the Senate. Virtually every Republican campaigned promising full repeal." In the meantime, The Hill is stirring the pot with a new article quoting unnamed "aides" who think leaders may strip out the Planned Parenthood provision to spare Republicans the headache. Of course, no one knows who these aides are or even if they're on leadership staff. In our Senate meetings, we've been assured that Republicans are sticking with the plan to cancel Planned Parenthood's taxpayer checks. Even Senator John Cornyn (R-Texas) pushed back on the rumors, insisting that the GOP has had "ongoing discussions" about zeroing out Planned Parenthood's funding for the year. "I'm not aware of any conclusion that's been reached on that." If anything, the Senate may be expanding on the House bill to include deeper cuts to ObamaCare. Encourage them to hold their ground on both! 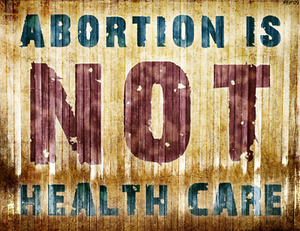 Contact your senators and ask them to get taxpayers out of the abortion business -- in health care and beyond! Tags: Byrd Rule, recognziliation. funding bill, Planned Parenthood To share or post to your site, click on "Post Link". Please mention / link to the Greater Fitchburg For Life. Thanks! Dr. Bill Smith, Editor: My heart goes out to the people of Paris and especially to the families who's family members were murdered or are in emergency care. As you pray for these families and for the leadership of Paris and even our own country, please consider sharing the following image on your social media. The image is of the face Lady Liberty -- the Statute of Liberty -- weeping. The Statue of Liberty was given to people of the United States by the French people. A smaller version of the statute is in Paris. 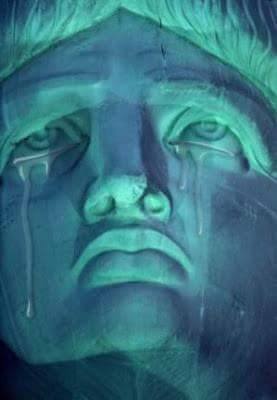 Tags: Statue of Liberty, Lady Liberty, weeping, Terrorist attacks, Paris, France, praying, #Paris To share or post to your site, click on "Post Link". Please mention / link to the Greater Fitchburg For Life. Thanks! Tags: Abortionist, Brutality of Abortion, Violence, It’s a Person, It’s Killing To share or post to your site, click on "Post Link". Please mention / link to the Greater Fitchburg For Life. Thanks! by Stephanie Woodward (Shared on National Right to Life): Having been born with a physical disability, I am all too familiar with the overwhelming number of people who feel that decisions should be made for me, not by me. I know the tactics used to coerce disabled people into doing what someone else thinks is best because they’ve been used on me. I am well aware of the “ableist” notions that society holds – that having a disability is a tragedy, that we’re a waste of resources and a burden on society, and that we’re “brave” to live with our disabilities (which essentially means that most people would rather die than be “brave” and live with a disability like me). We’re often regarded as incapable of making our own decisions and unworthy of respect. However, when one disabled person announces they want to die, they’re lauded in the press and on social media. 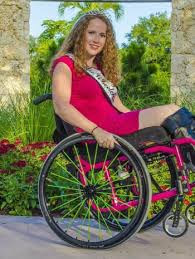 Sara Myers, for example, has Lou Gehrig’s disease and has received a slew of media attention for wanting assisted suicide because she began to experience disability. Media focused on Myers’s use of a wheelchair and her need for assistance in showering and toileting to demonstrate why assisted suicide should be available to her. For full disclosure, I use a wheelchair and have needed assistance with both showering and toileting in my life, and I expect I’ll need more assistance as I age. I take it very personally when media and society lists these as valid reasons to want to die. Current legislation proposed in New York to legalize assisted suicide not only has no realistic way of protecting from mistake, coercion or abuse, but also lists no reporting requirements. This means that any doctor could prescribe a lethal dose and any person could administer that dose to kill a person, with medical confidentiality preventing any oversight. No independent witness is required during the death of an individual, so there’s no way to ensure that the individual administered the lethal dose himself or herself. In a world where abuse of people with disabilities and seniors is rampant, this alone is cause for concern. For example, an adult child of an ill 80-year-old woman could accompany her mother to the doctor to obtain the lethal dose, and then administer it without her mother’s consent. Kate Cheney, an 85-year-old woman with early dementia, was brought to her doctor by her daughter to obtain a prescription for the lethal dose in Oregon where assisted suicide is legal. The doctor refused to write the prescription. Unfortunately, that did not prevent Ms. Cheney’s death. Instead, Ms. Cheney’s managed care provider found a different doctor to prescribe the lethal dose. This second doctor had Ms. Cheney undergo a psychiatric exam and found that Ms. Cheney lacked the capacity to make this decision, so the lethal dose was, again, not prescribed. Cheney’s daughter became very angry and demanded that her mother undergo another evaluation. This psychologist deemed Cheney competent, but noted that Ms. Cheney’s “choices may be influenced by her family’s wishes and her daughter, Erika, may be somewhat coercive.” Soon thereafter Ms. Cheney took the lethal dose and died. In recent years, plenty of medical professionals have deemed that assisted suicide is appropriate solely if a person is disabled. For example, according to the New England Journal of Medicine, most of Dr. Jack Kevorkian’s victims were not terminally ill, they simply had disabilities. Furthermore, the top reasons given for wanting assisted suicide are not pain or fear of future pain, but feeling like a “burden on others,” experiencing a “loss of autonomy,” or a “loss of dignity.” These factors are all disability related, as disabled people are often made to feel like burdens because we need assistance, which also contributes to the perceived loss of autonomy and dignity. I, along with my allies in the disability community, urge all New Yorkers to understand that assisted suicide is not a “right” to be glorified, but a double standard that is lethal to communities that are already marginalized, oppressed and abused. We deserve the same suicide prevention that nondisabled people enjoy, because despite the widespread belief otherwise, I assure you, our lives are worth living. 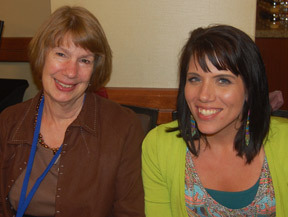 Tags: Assisted Suicide, disabled people, Stephanie Woodward To share or post to your site, click on "Post Link". Please mention / link to the Greater Fitchburg For Life. Thanks! Tags: Intruder Kills, Pastor’s Wife,, Their 12-Week-Old Unborn Child, But Law Says, Baby Didn’t Die To share or post to your site, click on "Post Link". Please mention / link to the Greater Fitchburg For Life. Thanks! Mike Huckabee: How Can We Pray “God Bless America” When We’ve Killed 60 Million in Abortion? Tags: Mike Huckabee, How Can We Pray, “God Bless America,” Killed 60 Million, Abortion? To share or post to your site, click on "Post Link". Please mention / link to the Greater Fitchburg For Life. Thanks! by Jim Sedlak: Vice President of American Life League and one of the nation's leading authority on Planned Parenthood, explains how to stop Planned Parenthood from getting into communities and how to get it out if it's already there. Tags: Jim Sedlak, Vice President, American Life League, how to, stop, Planned Parenthood To share or post to your site, click on "Post Link". Please mention / link to the Greater Fitchburg For Life. Thanks! by Kelsey Harkness, The Daily Signal: A little-known whistleblower lawsuit accuses Planned Parenthood clinics in Iowa of wrongly siphoning millions of American taxpayer dollars with a series of complicated billing schemes aimed at increasing profits. The lawsuit, brought by Sue Thayer, a 17-year employee of Planned Parenthood in Iowa, coincides with a national scandal over undercover videos that show the organization’s officials in other states talking about the sale of body parts from aborted babies. Tags: Planned Parenthood, scaming medicare, Birth Control Pills To share or post to your site, click on "Post Link". Please mention / link to the Greater Fitchburg For Life. Thanks! Tags: Maine, Sues, Pro-Life protester, Planned Parenthood, Yelled So Loudly, Disrupted Abortions To share or post to your site, click on "Post Link". Please mention / link to the Greater Fitchburg For Life. Thanks! Tags: Reese Witherspoon, Planned Parenthood, Abortion To share or post to your site, click on "Post Link". Please mention / link to the Greater Fitchburg For Life. Thanks! If you need any more proof that the Democratic Party is the party of abortion and beholden to the Planned Parenthood abortion business, look no further than the United States Senate. There, Democrats today blocked a resolution to honor pregnancy centers that provide women with abortion alternatives and help support pregnant women and facilitate adoptions. Tags: Democrats, Block Resolution, Honoring Pregnancy Centers, Providing Abortion Alternatives To share or post to your site, click on "Post Link". Please mention / link to the Greater Fitchburg For Life. Thanks! by Melissa Ohden: November is Adoption Awareness Month. Adoption is the option that everyone can live with–the mother, the father, the extended families, and, literally, the child. Over fifty-five million [now over 57 million] lives ended through abortion in our nation have left countless women, men, and their families wounded. Adoption, by contrast, brings a legacy of life and love into this world. Both create a ripple effect for generations to come, one for ill, one for good. Yet we live in a world today that often talks about adoption in disparaging terms: Adoption is a burden on women. No right person would ever “give up” their child. I’ve had women state that because they could never ‘give up’ their baby, they would abort them, instead. families that make adoption an unappealing option in the face of an unplanned pregnancy. I am certainly not buying that or any of the other misconceptions about adoption in our world. What I am going to do, though, is continue to fight for abortion to be abolished and adoption to be looked at as the positive choice that it is. I will do my best to encourage people to have conversations that encourage others to do likewise. Take advantage of Adoption Awareness Month this November, and have the conversation, in person with people or via social media and the Internet. Together we can change the lens through which adoption is looked at and talked about in our world. Editor’s note. Melissa is the survivor of a “failed” saline abortion in 1977. She speaks all over the world including at the last five National Right to Life Conventions. This first appeared in 2013. Tags: abortion, adoption, life, Melissa Ohden, November, Adoption Awareness Month To share or post to your site, click on "Post Link". Please mention / link to the Greater Fitchburg For Life. Thanks! Bill Donohue, Catholic League: The Los Angeles Times and the New York Times want the U.S. Supreme Court to reject the religious liberty claims put forth by Catholic non-profits challenging the constitutionality of the Health and Human Services (HHS) mandate. Both newspapers either underplay or ignore the central issue involved in this case. The Los Angeles Times says the Obama administration "has offered religious schools and charities that object to some birth control methods a reasonable and respectful accommodation." It says they do not have to pay for services they deem objectionable: all they need to do is inform the government of their reservations and let insurance companies and the government take it from there. The New York Times says essentially the same thing. But it also slams Catholic organizations for their "well orchestrated assault on the right of women to control their own bodies...."
Both papers miss the central issue involved: The federal government has no legitimate business telling Catholic organizations that hire and/or service non-Catholics that they forfeit their claim as a Catholic entity. The word "catholic" means universal. Therefore, any Catholic group that discriminates against non-Catholics in their social service programs is in clear violation of the very definition of that term. The Obama team picked up this pernicious definition of what constitutes a Catholic organization from the ACLU. This is at the heart of the objections by the Little Sisters of the Poor: Preposterous as it sounds, the nuns are declared to be insufficiently Catholic because they do not limit their services to Catholics! This is the real assault on women's rights. So even if the accommodation were deemed not to be a "substantial burden" on these Catholic groups, the government should have no right to invoke such spurious hiring and servicing criteria in deciding which Catholic groups are legitimate and which are bogus. Tags: HHS Mandate case, real issue, Bill Donohue, Catholic League To share or post to your site, click on "Post Link". Please mention / link to the Greater Fitchburg For Life. Thanks! Tags: California, Pastor. I’d Go to Jail, Before Being Forced to Fund Abortions To share or post to your site, click on "Post Link". Please mention / link to the Greater Fitchburg For Life. Thanks! Tags: Former, Bryan, Texas, Planned Parenthood Abortion Clinic, Re-Opens,Pro-Life Pregnancy Center To share or post to your site, click on "Post Link". Please mention / link to the Greater Fitchburg For Life. Thanks! Tags: Planned Parenthood Clinic, Caught, Selling, Aborted Babies, Refuses to Attend, Legislative Hearing To share or post to your site, click on "Post Link". Please mention / link to the Greater Fitchburg For Life. Thanks! The suffragette movement is the subject of the new movie Suffragette. Starring Carey Mulligan, Helena Bonham Carter and Meryl Streep, it tells the story of the struggle for women’s rights in Great Britain from the viewpoint of a young, working-class mother. Thousands of women like her fought courageously for the right to vote so they could use that power to improve the economic and social conditions that oppressed them and their families. In America, too, brave and farsighted suffragettes worked to obtain the right to vote, and thus the right to true citizenship, for women. Their victory paved the way for the full participation by women in the economic, social and political spheres. Our nation has been incomparably enriched by their contributions and accomplishments. But would those early pioneers recognize the movement that claims to speak for the rights of women today? On the issue of abortion, they would not. Many of today’s feminists see abortion as one of the touchstones of their movement. Yet many of the early leaders of the women’s suffrage movement in the U.S. believed that the rights of mother and child are inextricably linked and that the right to life and the right to vote are rooted in the inherent dignity of each human person. 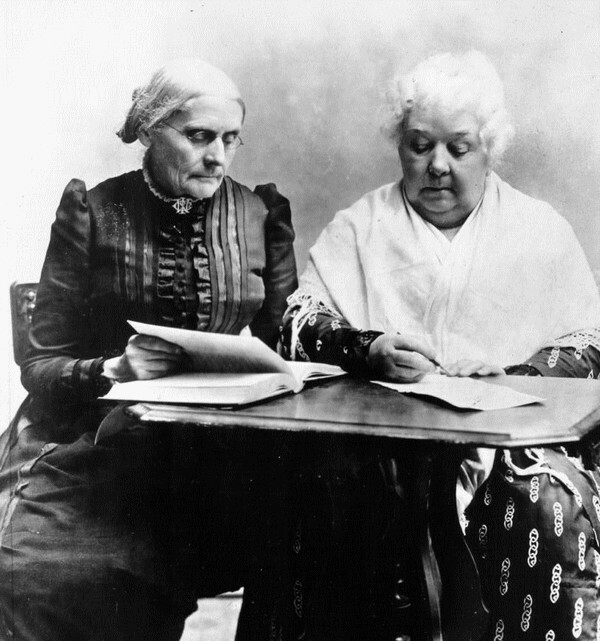 Mrs. Pankhurst’s American counterpart, Susan B. Anthony, was a friend and heroine to many of these women. Along with Cady Stanton, she founded The Revolution newspaper, which served as a mouthpiece for the American women’s suffrage movement. Anthony funded the paper herself, refusing the capital that would have resulted from allowing advertisements for “restellism,” as abortion was then called. The Revolution published a piece, attributable to Anthony, that said abortion was a choice that would burden both a woman’s “conscience in life and soul in death” and also ultimately an exploitation of women. Anthony has been my organization’s namesake since 1992, when we began the Susan B. Anthony List to amplify the voices of pro-life women in federal and statewide office. She understood that the rights of one group could not be built upon the broken rights of another. That’s why, for example, she worked so closely with her friend Frederick Douglass to advance not only women’s suffrage, but voting rights for African Americans as well. “Men, their rights and nothing more; women, their rights and nothing less,” she said. Note: Mallory Quigley, Communications Director, Susan B. Anthony List SBA List provided this article by Marjorie Dannenfelser which was run on Time magazine online. Tags: Suffragettes, then. Would not agree, With Feminists, Today, Abortion, Marjorie Dannenfelser, Susan B. Anthony List To share or post to your site, click on "Post Link". Please mention / link to the Greater Fitchburg For Life. Thanks! 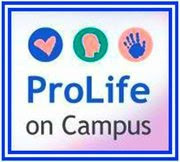 Tags: Pro-Life Message, Chris Christie, Impressed, Mark Zuckerberg To share or post to your site, click on "Post Link". Please mention / link to the Greater Fitchburg For Life. Thanks!